These workshops are suitable for anyone who wants to work deeply with their own ‘demons’. The workshops provide a thorough grounding in this remarkable method for transforming and befriending negative emotions, fears, illness and self defeating patterns; and introduces the radical notion that to heal and transform ourselves we must ‘feed’ not fight our demons. The process has been developed and carefully designed by LamaTsultrim Allione, author of ‘Women of Wisdom’ and ‘Feeding Your Demons’. The five steps of the practice take one through the entire process of transforming ‘demons’ into allies, whereby the energy that is caught up in inner conflict becomes liberated and available to us as a resource. Vajralila and Sudakini have trained with Tsultrim Allione at her retreat centre in Colorado and are currently the only certified UK facilitators. They are also both fully qualified and registered Psychotherapists and ordained Buddhists. Feeding Your Demons is a process that is grounded in the ancient wisdom of a female Yogini called Machig Lapdron who lived in the 11th century in Tibet. She is said to have been an enlightened woman who began a female lineage of wisdom that is still being passed down and performed today in the form of a practice called Chod. 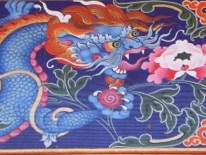 Machig integrated Shamanic wisdom, which was strong a thousand years ago (Bon Shamanism), and Tibetan Buddhism. Lama Tsultrim Allione is a Buddhist teacher in the Tibetan tradition. She was one of the first women to be ordained as a nun in 1970 by the 16th Karmapa. Lama Tsultrim’s understanding of the western psyche as well as her deep Buddhist insight has led her to adapt the Chod practice into a form that westerners can benefit from and this form is ‘Feeding Your Demons’. 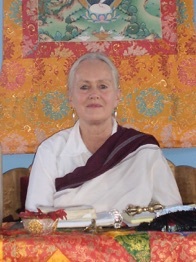 Sudakini and Vajralila are fortunate to have trained with Lama Tsultrim both in the UK and at her centre in Colorado, called Tara Mandala. "The process of feeding our demons is a method for bringing our shadow into consciousness and accessing the treasures it holds rather than repressing it. If the shadow is not made conscious and integrated, it operates undercover, becoming the saboteur of our best intentions, as well as causing harm the others. Bringing the shadow into awareness reduces it's destructive power and releases the life energy stored in it. By befriending that which scares us most, we find our own wisdom."